We’ve seen loads of images supposedly showing the OnePlus 5, and they’ve all included a vertically-aligned dual-lens camera, but a new leak suggests the lenses could in fact be aligned horizontally. The image, which was posted to Chinese social network Weibo, appears to be an official OnePlus 5 teaser, and shows an outline of the phone in black and white, with the camera array in the top-left corner and what’s likely an LED flash to the right of it. Other details include the expected OnePlus logo, and seemingly antenna lines at the top-left and bottom-right. That’s also different to what we’ve seen before, as most of the images leaked previously haven't shown any visible antenna lines. That could mean this new image is fake – it certainly wouldn’t have been hard to fake it – but we are expecting the OnePlus 5 to have a metal body, and if it does then antenna lines are likely, so it could be that the older images aren't genuine, or show unfinished prototypes. The change in camera alignment is the biggest red flag here, although the claim isn't entirely without foundation, as one earlier leak suggested horizontal lenses. So this image could be accurate, but we’d take it with the usual grain of salt. Elsewhere on Weibo, a leaked image that’s almost entirely obscured appears to say the OnePlus 5 will have a 3,300mAh battery. However, given that all we can really see is a small amount of text we wouldn’t read too much into it, and also goes against other sources, which have claimed 3,580mAh, 3,600mAh and even 4,000mAh battery sizes. 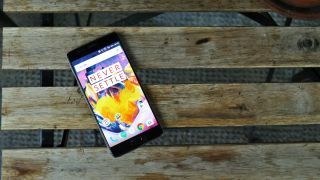 The good news is that we should get confirmation of the OnePlus 5's specs and features soon, as it's set to launch some time this summer.